Earlier this year my husband very kindly bought me a kindle. I absolutely love reading (although I must admit most nights I battle to stay awake for more than a few pages). 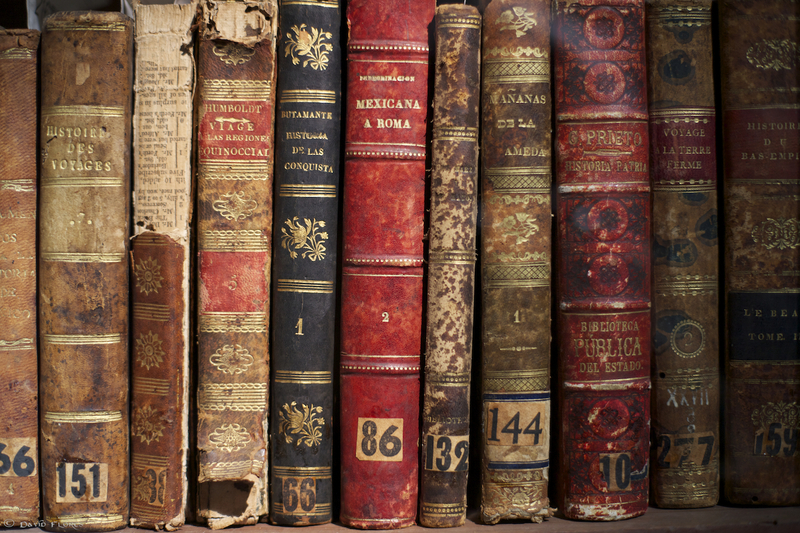 One of the best things about a kindle is the fact that one can get a vast library of free ebooks — any publication whose copyright is expired is in the public domain. Have a look at Project Guttenberg’s Website. I have always loved the classics — Jane Austen’s Pride and Prejudice was a firm high school favourite. What will be seen on August 15? One of the best parts of this type of business is finding all the fun, pretty, quirky, valuable, one-of-a-kind “treasures” that come our way. My favourite find of the week. 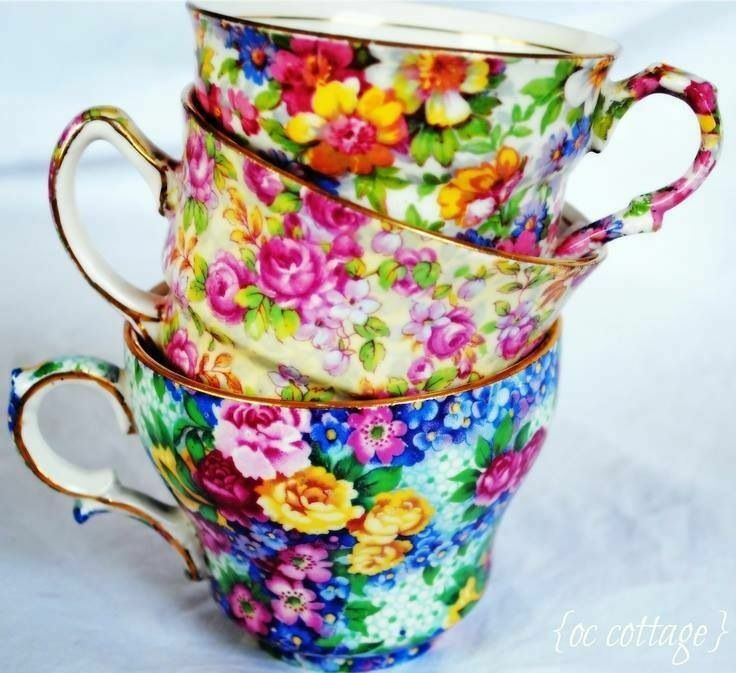 Three stunning pieces of china featuring designs from the “Diary of an Edwardian Lady”. I have come to realise that people have very different tastes in collectables. For some its the classic vintage collectors pieces which hold the most appeal. Other people enjoy adding some of the “kitsch” and quirky novelties to their decor. There are those who will only buy the most perfectly preserved items — no chips or scratches allowed. On the other end of the scale the fans of the “shabby-chic- look” seek out the rustiest and most “beat-up” odds and ends … have you seen “American Pickers” on the History Channel? Some lovely bunnykins pieces. Charming gifts for christenings and stork parties. Strangely I see the appeal of all these different looks. Which can be a problem because I am often tempted to keep most of the stock for myself. However, although my husband is a patient man, he might not let me stay if I invade the house with too much of my “junk”. So… I will be sharing our finds with all of you this week. The items in the pictures represent a good mix of what we will be dropping off at House of Heart tomorrow. Be sure to pop in and have a look! This elegant yet practical piece is a teapot warmer! I literally laughed at this assortment of goodies .. where else would you find a monkey holding a tray, a pottery angel and a really kitsch elephant salt and pepper set? Lollapalooza right? So here are a “few of my favourite things”! I bet you’ll want to sing along to the original tune (from the Sound of Music)! These are a few of my favourite things! A bucket and watering can which couldn’t look older! And then you won’t feel so bad! I popped down the House of Heart today … loaded up with lots of interesting new goodies. To avoid disappointment … pop in soon if anything tickles your fancy PS … be sure to scroll all the way down …. there are lots of pictures today! Some fun and funky pieces all priced up R40 and under! Some lovely brass and copper goodies. Full of vintage charm. Priced between R20 and R80 each. A pot load of kitschy-cute ornaments. All priced below R40 each! A German-made Arzberg Teapot. A good size. Selling for just R100. You can still buy these new for over R500! A gorgeous array of top quality EPNS pieces. Priced at R295 and less. In light of this I have done a bit of a display of pretty plates this weekend at House of Heart Emporium — I do have a whole lot more available so will be re-stocking with new plates next week. I have priced all of them very reasonably — just R10 and R15 each! I just love the use of these pretty plates as frames! So here are some phone camera snaps of the shelves … but I promise the real thing is a whole lot better so be sure to pop in soon! Hi everyone, I think we are suffering from what one could term far-too-many-public-holidays-itis. Don’t get me wrong … the chance to sleep in a little on these increasingly cold mornings is always welcome. However, I would have preferred to be a little more productive than I have been lately. Anyway, I have all the stock packed and ready (well .. it will be soon) and will be popping down to House of Heart Emporium first thing tomorrow. I will literally be bashing down their doors at 9am! Lots of lovely cutlery sets priced from R140 to R240. In an uncharacteristically productive moment I managed to snap a few shots of some of the goodies I will be adding to our stand tomorrow. Please do have a look at what will be in store this weekend. If there is anything you fancy … I suggest you rush along to House of Heart asap tomorrow too. I think any of these goodies would make an awesome and original Mother’s Day prezzie … and how amazing would it be to be able to avoid the mall this weekend? A charming Wedgwood Duo … we have a few of these selling at R70 a duo. Lovely for the espresso drinker. PS aren’t those flowers pretty? I just love them. The milk jug and sugar bowl. This is such a pretty pattern and the colours are just perfect. A glass dish with lid for R65, a patterned dish for R45 and a sweet little EPNS and glass jam pot with a spoon for R75. Don’t you love the newly branded market poster? On Friday afternoon my sister and I headed down to the Dunrobin Market at the House of Heart Emporium. Their newly branded markets are on the last Friday night (from 5pm to 9pm) and Saturday morning (9am to 1pm) of every month. The market has a strongly handmade feel so I took along lots of my up-cylced china pendants and other vintage-style jewellery. We also stocked up the shop with lots of vintage delights! Our stall at the market. Lost of pretty lights and bunting added to the atmosphere. It was lovely to meet up with old friends and make some new ones. Jessica and Justin from Blacksmith Co were there with lots of very cool metal creations (have a look at their website). I also met Francis Ridl who makes beautiful jewellery with pottery accents and charms. After talking to her for at least ten minutes it finally dawned on me that she is married to my dad’s cousin and we have met at a few family functions! I thought I recognised Frances from somewhere! Erika Whitby was there displaying some of her beautiful photography; Silver Penny was selling some stunning silver pieces; there was stunning up-cycled furniture and loads of other tempting goodies. All the pendants, earrings and rings … ready to sell! Apart from all the pretty, crafty items there was lots of yummy food on offer. Maybe a little too much… There were wood-fired pizzas (made in a brick oven on site); hamburgers, pancakes, curry and lots of sweet treats. A close-up of some of the pendants. People gathered around the bonfires, caught up with old friends and enjoyed the music by the group “Minor Adjustments”. Later in the evening some of the visitors took a chance to show off their dance moves. Particularly impressive was an elderly gentleman who seemed to manage to find a different lady with which to dance for every song! As always, it was wonderful to meet the friendly people of Pietermaritzburg (best city in the world!) and it was great to see the beautiful House of Heart Emporium packed with shoppers. My sister is the best market buddy ever … she has been so busy studying for her teaching degree I can’t bother her to help me out as often as I used to. I am sure the Saturday market was equally entertaining. I had a another market to attend this time but I will try to make it next month. Hope to see you there! It recently occurred to me, while going through our vintage stock, just how many of the well-loved vintage bits and pieces have some sort of link to the ceremonial drinking of tea. Think about it … teapots, cups and saucers, sugar bowls, milk jugs, EPNS teaspoons and sugar tongs, tea trays, tea strainers, tea coseys and tray cloths. It would seem that tea time was a very important part of people’s lives in days gone by. Although it is probably just as enjoyed by many nowadays, we certainly don’t seem to serve it with quite the same sense of elegance. Perhaps it would be worth taking the time to enjoy a beautifully presented tea tray? 1. A pot of tea is always sure to yield a second or third cup… without requiring another trip to the kitchen. Perfect for passing a lazy afternoon on the verandah! Tea in the garden, what a treat. 2. 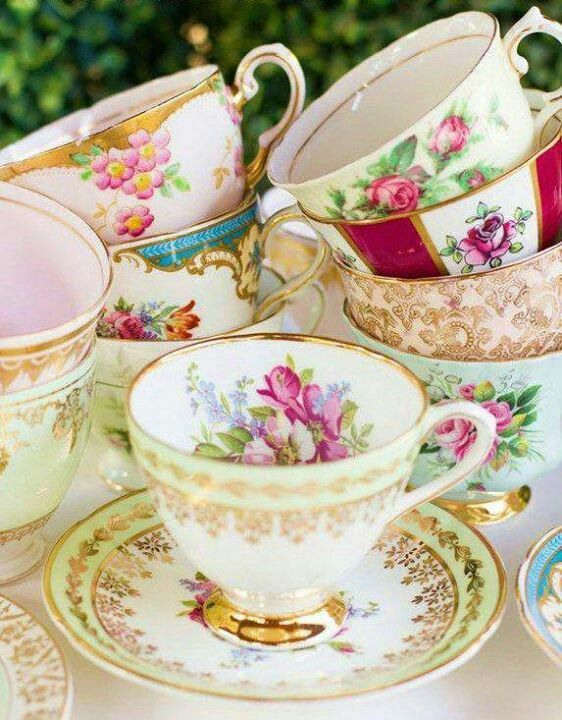 Nothing beats the prettiness of a vintage teaset. 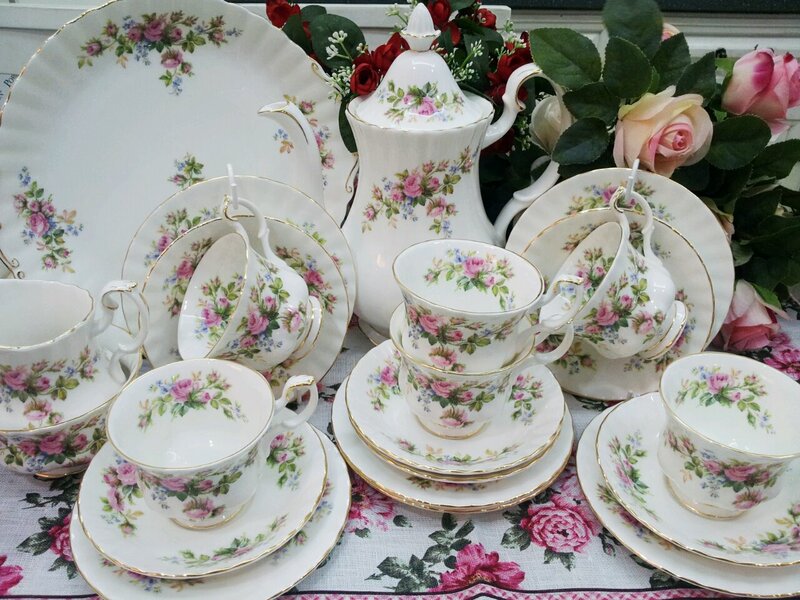 I have a dear elderly friend who serves tea with her Royal Albert Moss Rose set — its beautiful! She is happy to allow you to drink tea from it … but she does not allow anyone to help with washing it afterwards. 3. Its a good excuse to buy a pretty tea cosey. The ladies from Roses and Raggamuffins at House of Heart make the most adorable tea coseys! 4. Maybe its psychological … but have you ever noticed how wonderful tea tastes in a real porcelain cup? Those heavy, cheap stoneware mugs just don’t compare! 5.If someone has gone to the trouble of preparing an elaborate tea tray … chances are that there will be a host of amazing teatime treats on offer too. Think scones, cup cakes, rusks, biscotti, lemon meringue pie … or maybe some cucumber sandwiches. Pretty cupcakes just go so well with a pretty teaset. 6.Ever since I can remember, my granny has loved tea. She and Grandpa would have some brewing at almost any time of the day. She always laid out a tray with her favourite Indian Tree tea set. My gran is now a very healthy 92 year old …could tea be her secret? 7. Tea is the best cure for a bad day. So many times over the years my very worst days were made better by a cup of tea with my mom, sister or friend. Making someone tea in their hour of need is like saying … “I don’t know how to fix the problem but I am here for you.” My Mom has had the same simply stainless steel teapot for years … I bet that old thing could tell some tales! Hope this inspires you to get Granny’s old teaset out of the cupboard and share a special tea time with a friend or loved one. 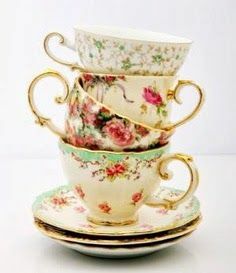 I am not quite sure why, but I have always loved teacups and saucers. Teapots are equally charming. To be honest, I seldom drink tea out of a teacup nor do I use a teapot for making tea. (Sticking a teabag into a mug is a much easier option). 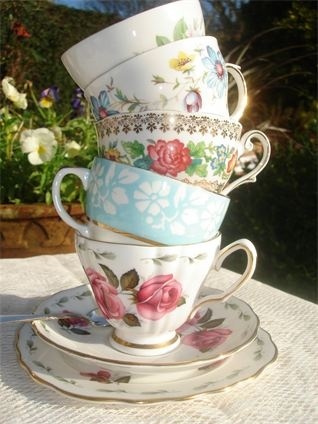 I do, however, just adore displays of pretty cups and saucers. I recently had a look on pinterest for inspiration and here are some of my favourite finds! These “multi-flora” patterns are so richly detailed! 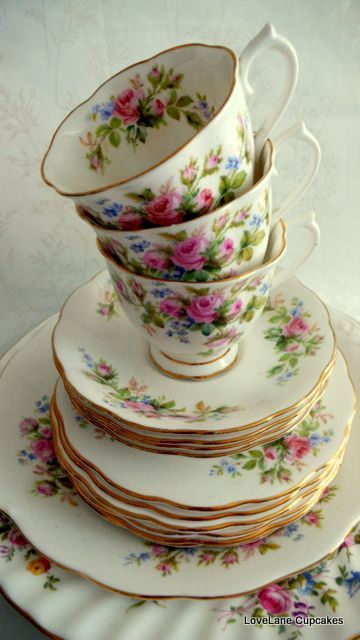 Royal Albert’s “Moss Rose” — one of my all time favourite patterns of teacup! 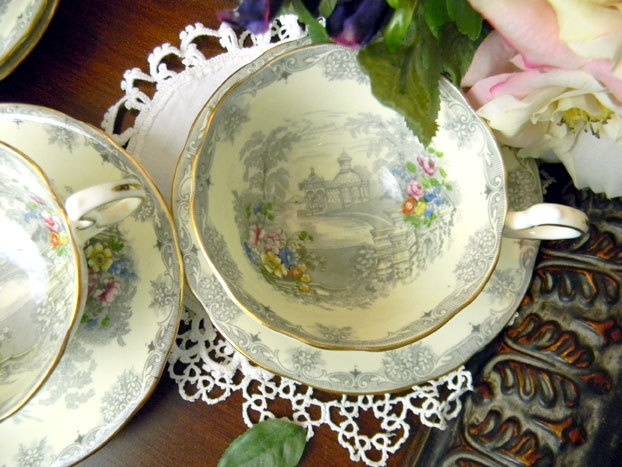 These Aynsley teacups are even pretty on the inside!